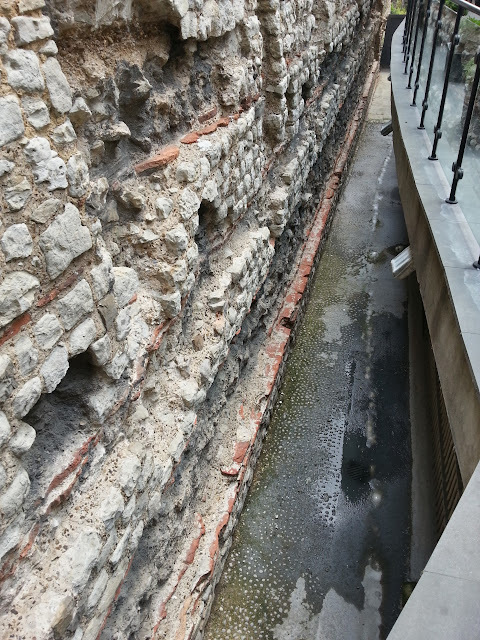 Following on from my previous post regarding the city wall at Trinity Place, this post was to deal with the other "not obscured" section of Roman city wall in the Tower Hill area known as Cooper's Row. However, whilst researching this topic I have discovered a previously unknown (to me that is) section right here, which although I have not attempted to gain access to yet, I have found photographic evidence of. The street Cooper's Row owes its name to the coopers (barrel / cask makers) who stored their casks in recesses of the city wall in this area. The coopers have long gone, but the city wall remains to this day. Despite being little more than 50 metres from the exits of Tower Hill tube station, many visitors to London and general passers-by are unaware of the remains of the city wall here, as they are tucked away from casual view, being situated between the rear of the courtyard of The Grange - City hotel and The Crescent, EC3. 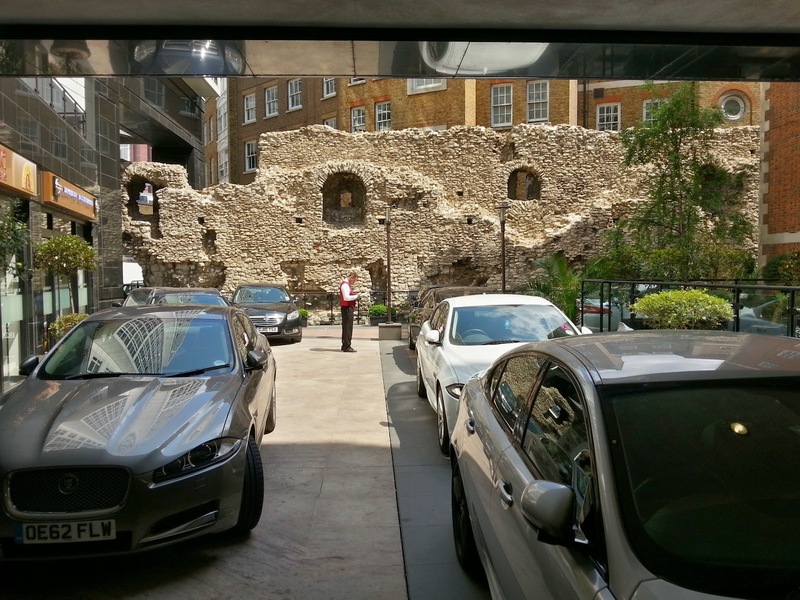 Access can freely be gained either from the west via the hotel courtyard and car park entrance along Cooper's Row or from the east via a passageway between the Fenchurch railway viaduct and the rear of the houses of The Crescent. The bridge through the archway leads to a passageway to The Crescent. As with many other sections of the city wall, over time these structures were often lost when incorporated into fabric of other buildings. Having escaped the destruction of the Great Fire of 1666, the area around Cooper's Row would have been in continual usage for dwellings and businesses for over 1,000 years, and when the wall lost it's importance as a defensive structure it would have been swallowed up by surrounding buildings. By the 19th century this area of London was occupied with warehouses and storage vaults associated with the wharves and quays of the nearby Port of London, many of which were owned by the infamous British East-India Company. Soon after 1860 the site was acquired by a Joseph Barber & Company, a long established family business operating as wharfingers in the City of London. In 1862 the new owners set about redeveloping site into new bonded warehouses, for the storage and bottling of wines and spirits. According to Pevsner's guide, the architect of new warehouse, was Richard Norman Shaw and it is attributed as his first British building. 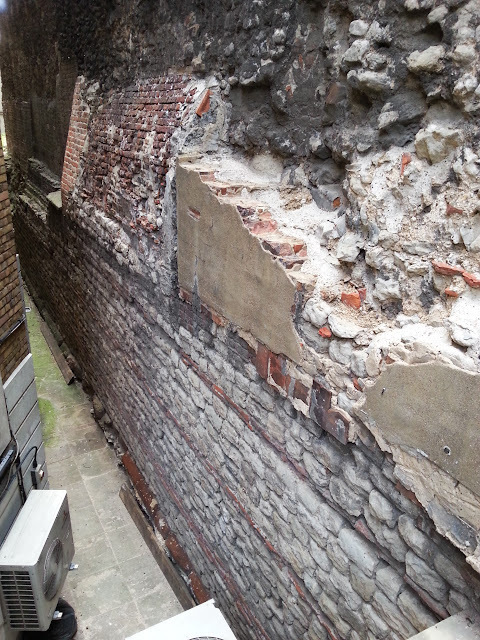 It was during the building work for this new warehouse in 1864 that this section of London Wall was rediscovered and first formally recorded. The new owners chose to preserve and display the wall within the new building where it was visible on the vat storage floors. Almost 100 years later, in 1961, these Victorian warehouses were in turn demolished, and the Roman Wall was made even more accessible as part of the current development originally known as Midland House, for Midland Bank and now a hotel complex. Looking East where the houses of The Crescent back onto the city wall. 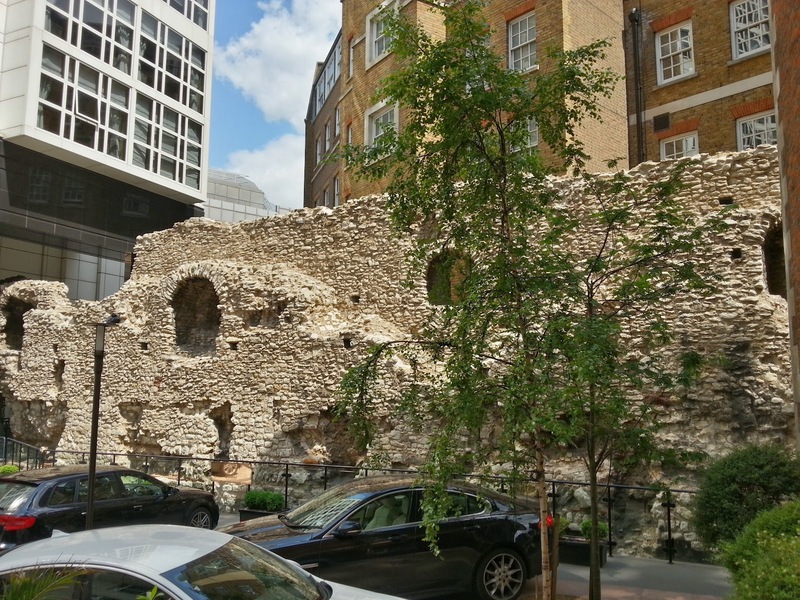 The wall here is regarded as the finest section of London city wall remaining. It stretches for 38m (125ft) in length and to the same height as the nearby Trinity Place section at Tower Hill to 10.6m (35ft). The main part of the wall, visible above modern ground level, is medieval in date with the 2nd Century Roman wall forming the lower parts, which is also visible due to being exposed by the basement level of the hotel car-park and also by a trench along the eastern side revealing the wall to it's Roman ground-level sandstone plinth. Excavations in 1962 during the last re-development of the site, revealed the foundations of a rectangular Roman inner turret 4.88m (16ft) x 2.39m (8ft), built at the same time as the wall itself around 200AD. This is likely to have contained a timber stairway, to give access to the parapet walk at the top of the wall. Only a small number of similar turrets have been found elsewhere along the wall in London, although practicalities would suggest there were many more, that remain to be discovered. The eastern side, at the rear of The Crescent gives a view of the best preserved Roman stonework. Here the original ground-level sand-stone plinths can be seen as well as the normal arrangement of regular courses of dressed rag-stone inter-spaced every four courses or so with red tiled bonding layers as can be seen in the photo below. The Roman layer stands to height of over 2 metres. Eastern (Outer) face of City Wall showing Roman stonework. The inner western face of the wall has not faired so well down at the Roman levels, where most of the dressed outer stonework has been damaged by later development work cutting in to the wall to bond adjacent walls of other buildings. Western face showing defaced Roman stonework. The upper section of the wall here is from the medieval period, from as late 1200AD. Features on the wall from this period are several archers loopholes, the remains of a double staircase to the upper levels (the v-shaped indentation centred around loophole just to the right of centre in the photo below) and several post sockets holes, thought to have been used to supported a timber platform. This arrangement appears to be unique to this part of the city wall. The western side of the wall at Cooper's Row. The original tiled panel number 3 from the Museum of London's "London Wall Walk" is no longer at this location, but there is a brass panel information panel on the railings next to the wall, which can be seen in the photo above, and also another positioned back out on Cooper's Row, on the wall of the hotel just to the right of the entrance to the car park. This is also in brass which does not make for easy reading in bright light, and hence is probably missed by most passers by. 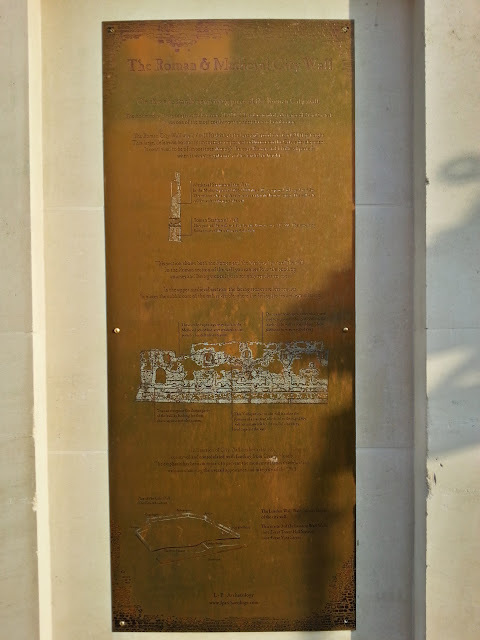 Information plaque on the wall of hotel, Cooper's Row. 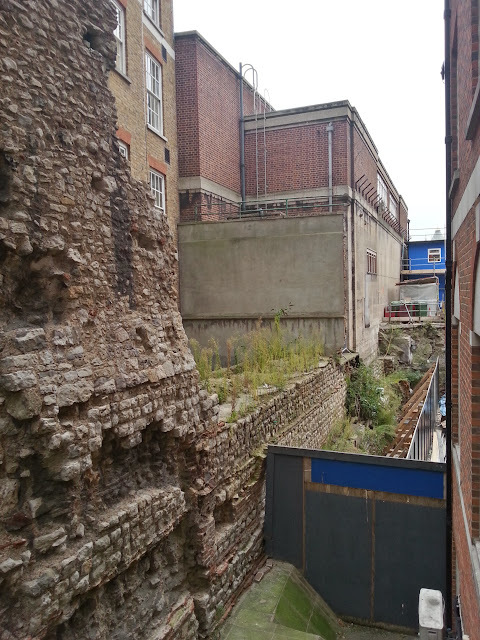 From the Cooper's Row site, looking south, there is for the moment a view of the Roman portion of the city wall continuing towards Tower Hill underground station. This has been visible, during 2013, due to the re-development of the site at the end of Cooper's Row adjacent to the station. 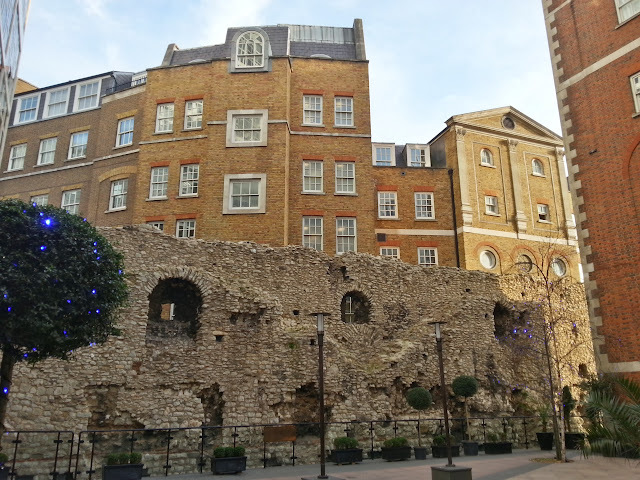 This development known as Tower House, 38-40 Trinity Square, is planned to be a 9 storey, 370 room hotel complex, but they are proposing the formation of a pedestrian walkway along side the section of Roman Wall visible in the photograph below, which will give public access to this part of the city wall for the first time. continues towards Tower Hill tube station. Also visible in the photograph above, in red brick, is the rear of the electricity sub-station built in the 1930's over the Tower Hill underground station platforms. The front of the sub-station is at the southern end of The Crescent. Although there was a basic attempt at an adherence to the aesthetic of The Crescent with the right-hand bay and boundary wall continuing the curve of the adjacent buildings, it is fairly described by Pevsner as "unsightly". 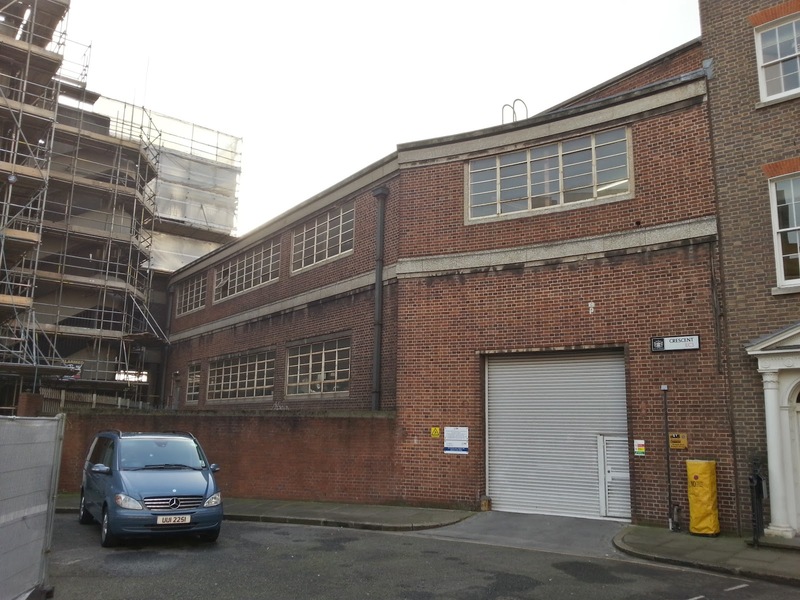 1930s electricity sub-station in The Crescent. The western wall of the sub-station it literally build on top of the Roman city wall here and it's eastern face can be seen with the basement of the building. 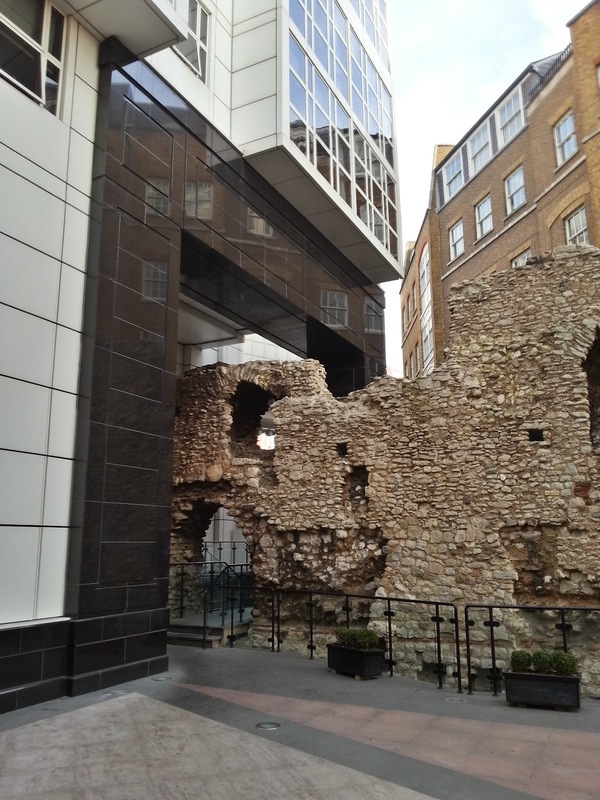 I have not tried to gain access here yet to see first-hand the wall, but did come across the photograph below in the Archaeological Assessment report, for the proposed hotel at 38-40 Trinity Square. The foundations of the wall and its original ground-level sandstone plinth. Four courses of rag-stone up to the red-brick bonding layer can clearly be seen here too. 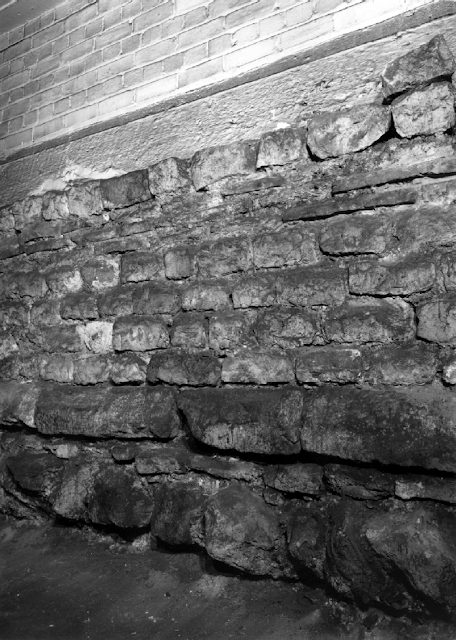 Roman city wall within the electricity sub-station in The Crescent. I do not own the copyright to this image. Also during the building of the sub-station, part of one of the Roman bastions which were added at set intervals to the external side of the wall during the 4th century, was recorded to have survived the cutting of the railway, but was demolished as part of the construction in 1935. Notable finds from the construction site in 1935 included part of the tombstone of Classicianus, the Procurator (finance minister) of Britain from the 1st century AD. This, like many other pieces of early Roman stonework, had been reused as rubble in the foundations of the bastions. Two other pieces of this tombstone had been found in 1852 and 1885 during the construction of the underground railway close to this site. This tombstone is now viewable in reconstructed form in the British Museum. During my research for this post, I struggled to limit the focus to the main subject, as there were so many side topics that could have been explored, directly related to the main subject. For one of these topics, the history of The Crescent I have created a separate post which may possibly lead to a new series of posts. And so this brings me to the end of a post which has taken about six months to research and write. Please refer to my Roman London page for background information to the Roman occupation of London, and see the list below for earlier articles in the series.